John Huster and Aiwah Chang wanted a home that felt like part of a community in Tahoe. They found what they were looking for in a 2,277-square-foot property in Dollar Point, but the house itself was small, outdated and lacked a garage. 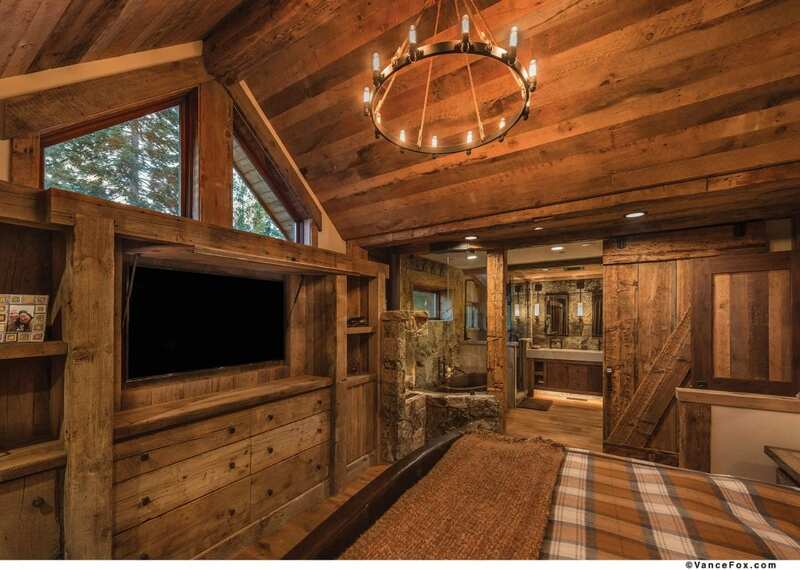 Behind the expertise of Tahoe City’s Welling Construction and Wittels Engineering, along with Truckee’s Aspen Leaf Interiors and Finishing Touch Carpentry out of Tahoe City, the couple achieved their vision, transforming the home from a 1970s chalet into a mountain lodge with a modern take on rustic appeal. 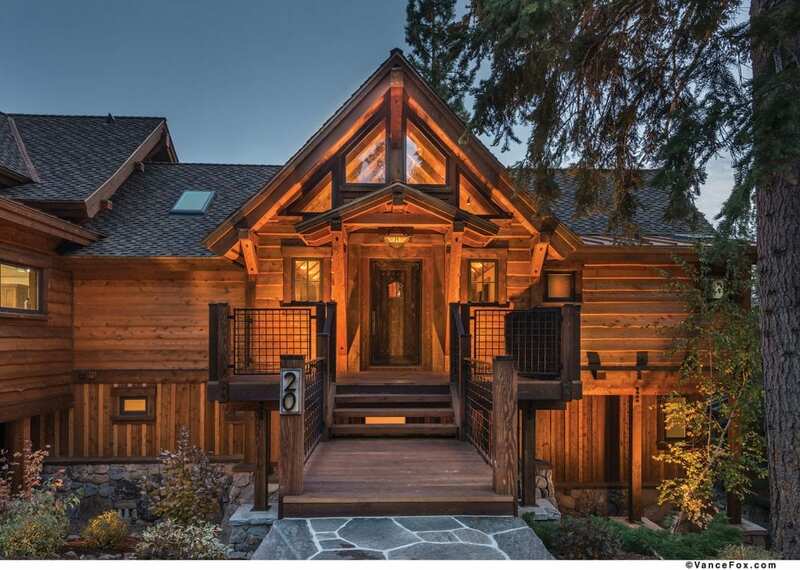 The rustic look starts with the home’s exterior, where a wavy-edged cedar siding blends with granite and steel accents. “This particular application was a custom order to get a more solid profile that they typically don’t sell off the shelf,” Welling Construction owner Brent Welling says of the siding, which was manufactured by Haida Forest Products out of Canada. The front door is solid cypress cedar wood, hand-built by the master craftsmen at Scottsdale Art Factory. An embedded peek-a-boo window and latch on the door add whimsical charm to the entryway. Inside, reclaimed Douglas fir beams wrap around the home’s original rafters and vaulted ceiling. “This room was pretty much the only space that stayed,” Welling says of the multi-purpose entryway and great room, which is anchored by a large granite fireplace surround built by Truckee’s Ken Saling Masonry. 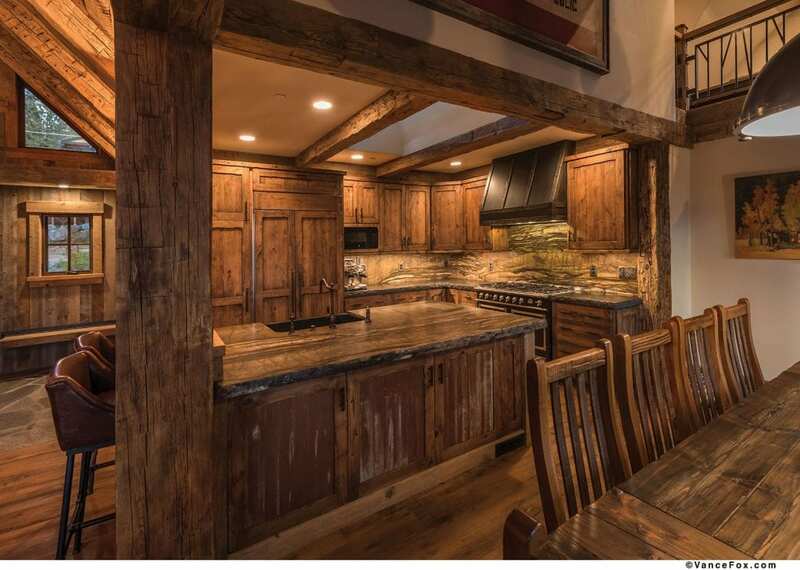 Marcio Decker, principal designer with Aspen Leaf Interiors, designed the kitchen to match the rustic theme of the connected great room. The kitchen is highlighted by knotty, aged cabinets built by Kenneth Goodman Construction out of Tahoe Vista, as well as an attractive sandalus granite–topped island with door panels made of recycled corrugated roofing. 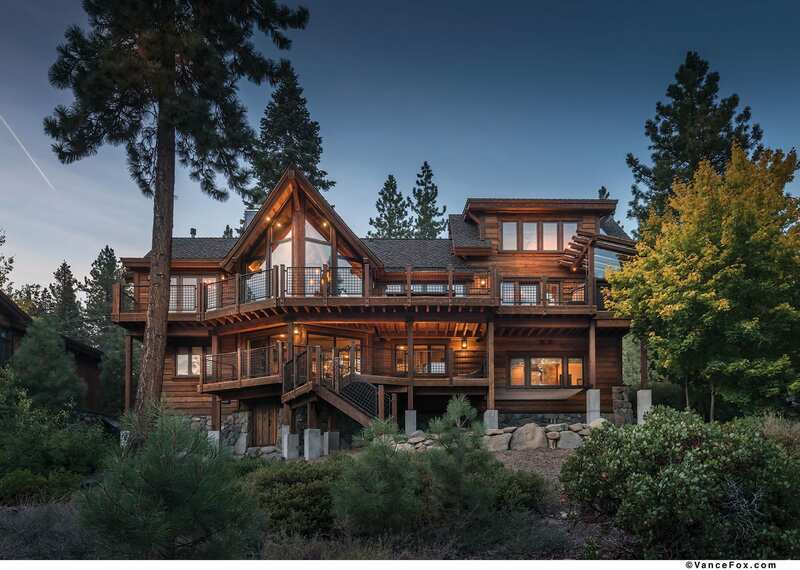 Beyond the great room’s fireplace, floor-to-ceiling windows look out to an expansive new deck that towers over the steep-sloping lot, with views below to a particularly shimmery, sunlit portion of Tahoe’s North Shore. The deck is constructed of Alaskan yellow cedar, wire-brushed for an aging look, while a circular cedar hot tub was custom built into the corner of the deck. The hot tub overlooks The Lake on one side and is sheltered on the other by a privacy screen built of mesh with inlaid copper panels. A trellis overhead includes lights and speakers, and an outdoor shower with a quartz slab underfoot is conveniently located nearby. The master suite connects directly to the great room, with similar high vaulted ceilings and an open floor plan. Hand-chiseled windowsills and shower wall caps by Ken Saling Masonry lend a rich variety of textures to the master bath, which includes an outdoor-inspired shower and a double-sink vanity with floating metal mirror frames. A stone fireplace is visible from a large copper soaking tub and the bed, and both vantage points include spectacular views of The Lake below. Decker says the master suite is among his favorite aspects of the remodel. “The woodsy materials are both rustic and cozy; it’s a room that makes people want to stay,” he says. The most significant change executed by the project’s team, which included Wittels Engineering in-house designer Julie Watterworth, is a garage that seamlessly abuts the original structure. Because of the sloping lot, Wittels Engineering owner Ken Wittels says a substantial retaining wall was built to support the new parking area and garage, which was designed to match the original home’s steep-pitched roof. “We wanted to have symmetry between the two structures,” Wittels says, adding that, because of the sloping lot, the garage was able to accommodate living spaces both above and below. The above portion is an open game room loft that looks over the great room—complete with a pool table, an old sit-down Atari arcade game and sleeping space. 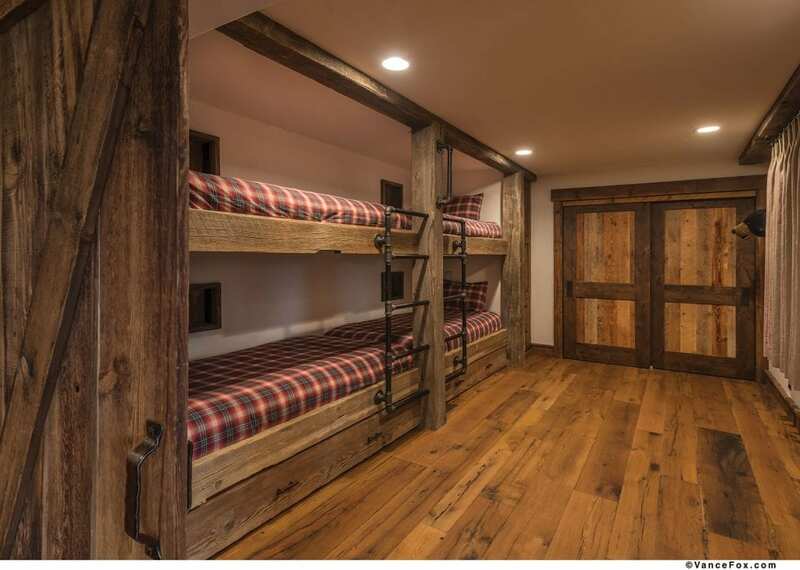 Downstairs, three bedrooms, including a bunk bed suite that sleeps six, provide room for the owners’ two children and guests. “Their goal was to make this house like a bunkhouse,” says Welling. Through a creative employment of space, the home, which was enlarged in the remodel to 3,407 square feet, was made to comfortably sleep 18. The project came together with a collaborative effort that involved numerous people. Even the owner got in on the action by building some of the bunk beds.